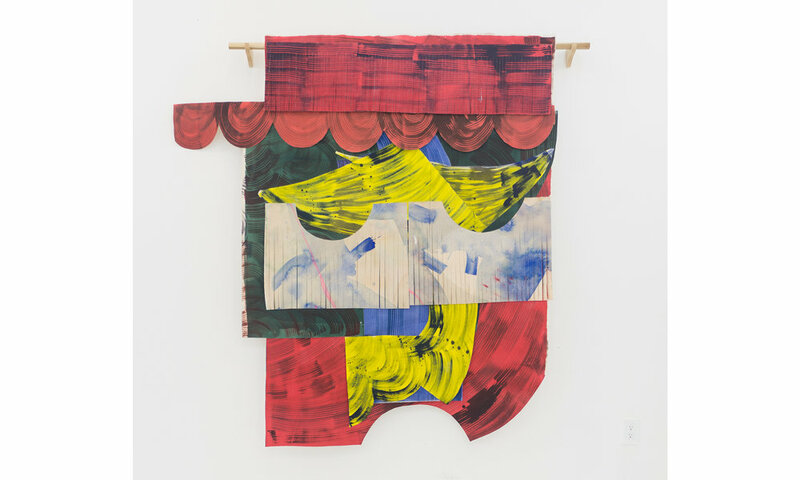 VICTORI + MO is pleased to announce Movers and Shapers, a dual exhibition of new works from New York-based painter Justine Hill and her Los Angeles contemporary Ali Silverstein. The exhibition, which marks the debut of both artists with the gallery, opens on January 5th and will remain on view through February 18th. 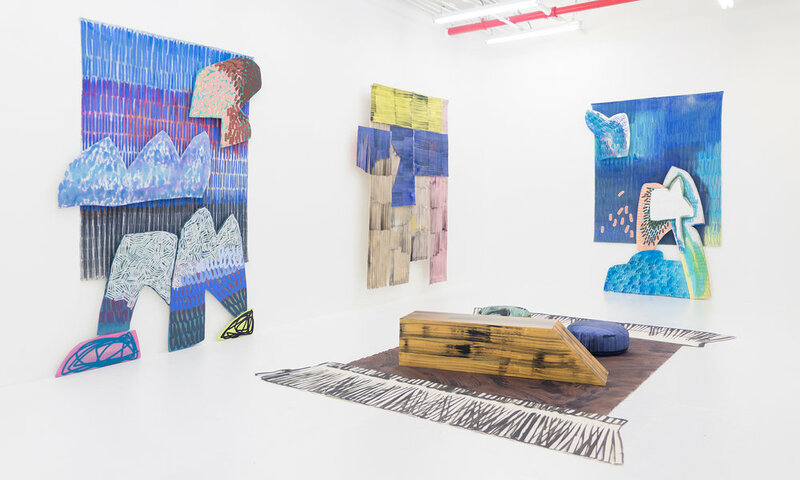 Justine Hill was first introduced to Ali Silverstein's work in 2015, at Untitled Art Fair, Miami. Hill admired Silverstein's handling of materials, particularly the pronounced extemporaneous brushstrokes upon large-scale cut-out canvases. She continued to follow Silverstein's practice through social media, which influenced her own work, primarily the mark-making upon her abstracted landscape paintings. Silverstein is a painter whose primary focus strays definitively from the traditional considerations of painting,and instead uses paint as a method and material to explore the concepts that she considers the foundation of her practice: spontaneous gesture, desire, and decision-making. She identifies a kinship with the romantic perspective of art critic, Harold Rosenberg, and the idea of the canvas as less of a means of representation but rather an extension of the uninhibited mind. The making of her paintings is intensely physical, not necessarily a formal performance but certainly a result of a series of present-moment gestural expressions manifest of the instinctual desires of the body. To that end, Silverstein uses unorthodox brushes, such as century-old brooms, as a means to create a vastly different approach to mark-making, which introduces wholly unique gestures into the work. 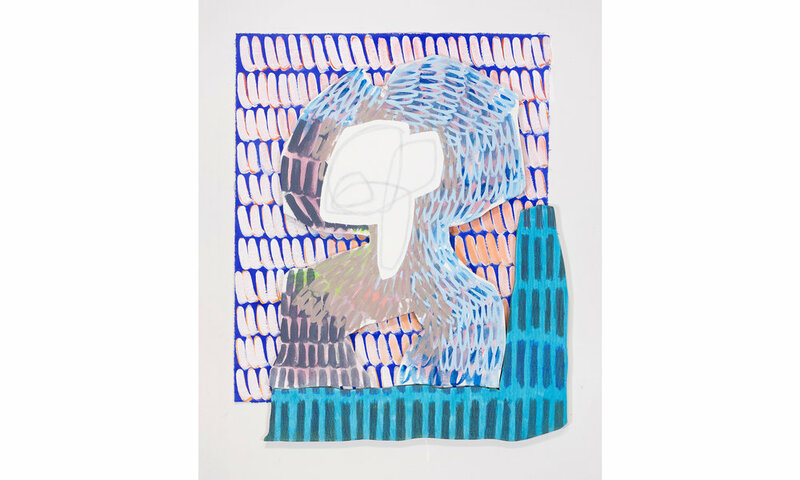 The new paintings merge the impulsive gestural reaction with the figuration of her earlier work, further blurring the line between the abstract and the representational. 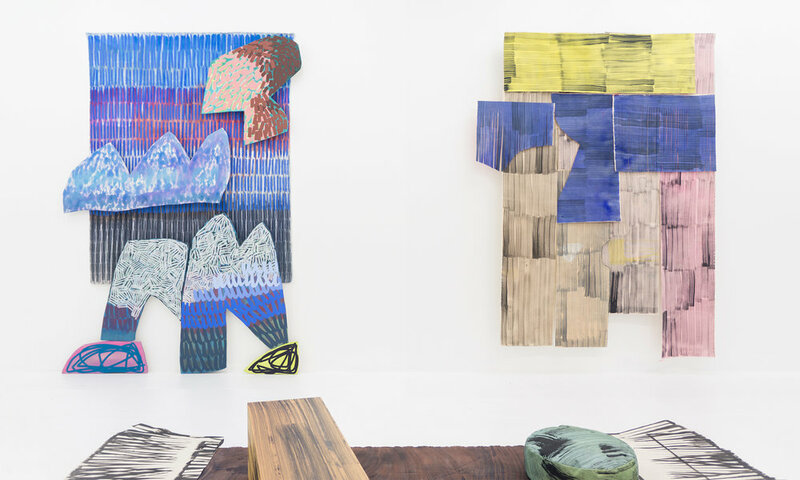 Hung away from the gallery wall, the works purposefully resemble wall hangings, curtains and layered drapes more than paintings, an intentional referent to the physical and decorative objects commonly associated with domesticity. Unlike the unpremeditated work of Silverstein, Hill's paintings are created within a narrower set of guidelines. 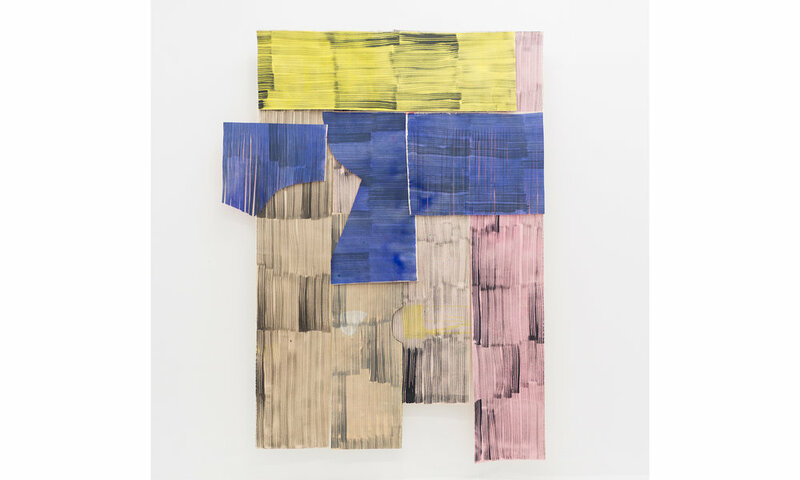 Prior to beginning a piece, Hill clearly defines the scale, shape and structure of each painting by building the structure which acts as her control element. The painting then develops with the back and forth assistance of sketching on the computer. 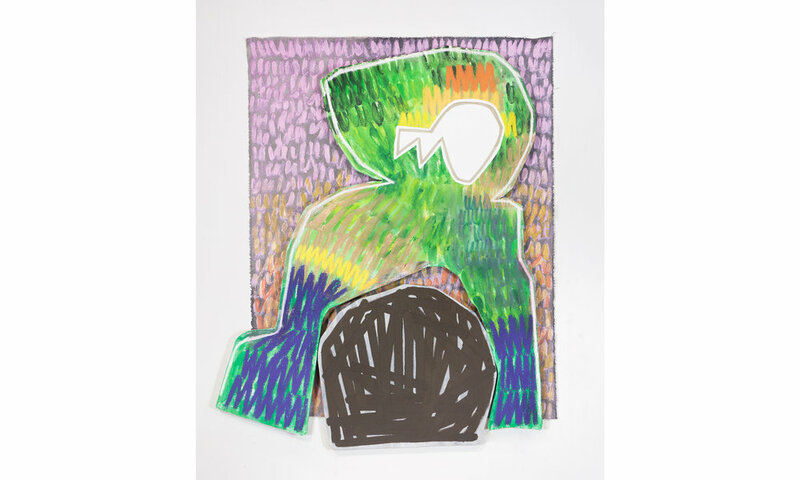 Hill's work is fundamentally interested in the act of mark-making, and how the composite of these varied marks (paint, crayon, pencil, or pastel) coalesce into a final painting. 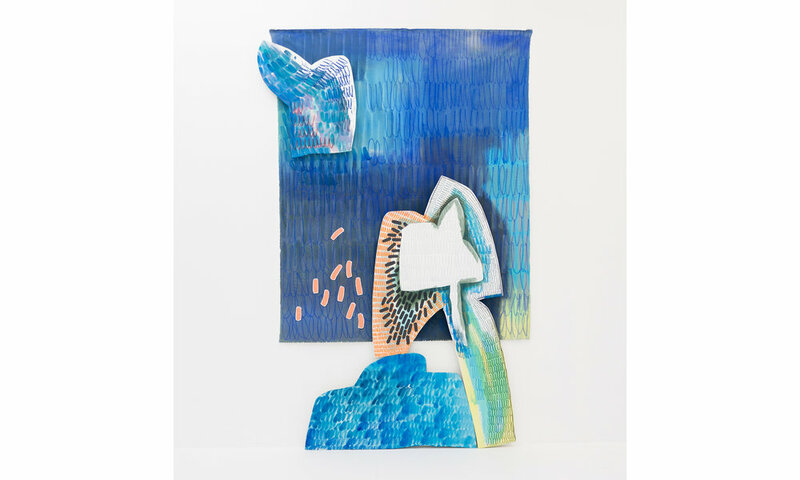 With her latest paintings, Hill explores the dialogue between figuration and landscape, the relational interplay between foreground and background, and the question of visual importance. The cut-outs, constructed from wood into irregular shapes and then covered in canvas, confer dominance to the figure form/foreground. 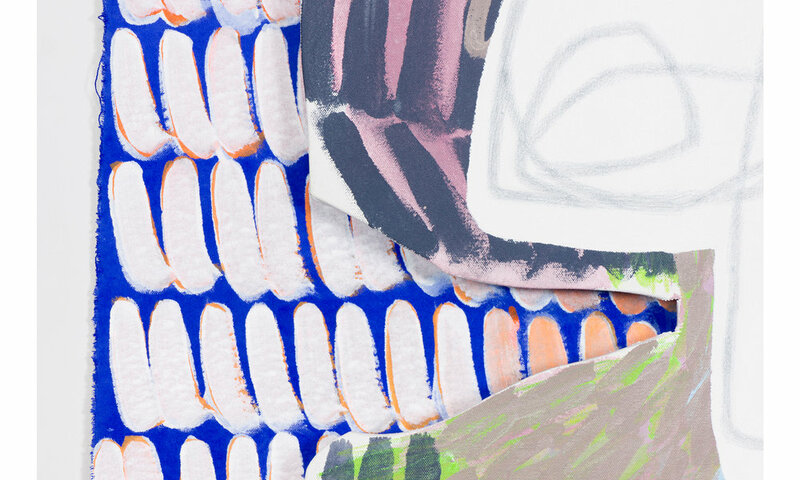 These non-rectangular pieces serve to personify the painting, which may bear a resemblance to an animated creature or moving environment, depending on their formation. 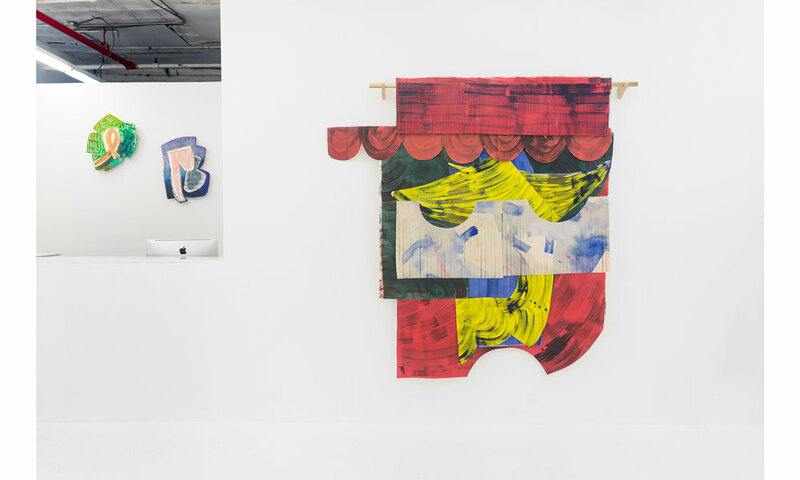 In order to exaggerate the wall plane, for the first time Hill adheres the cut-out shapes to a rectangle, a torn unstretched canvas backdrop which rests against the gallery wall. While Hill's process of carefully considered studies and Silverstein's spontaneous physicality are distinct, the finished works share many associative traits. It may have been the gestured mark that attracted Hill to Silverstein’s work in the first place, but their interest in creating physical depth and objecthood and their shared method of cutting out and collaging to make a whole are essential elements in both practices. The title Mover and Shapers refers to many of these overlapping traits. While Silverstein’s work evolves more in the “moving,” and Hill’s work is decided more in the “shaping,” the combination is necessary. Justine Hill lives and works in Brooklyn, New York. She received her MFA from the University of Pennsylvania and her BA from the College of the Holy Cross. 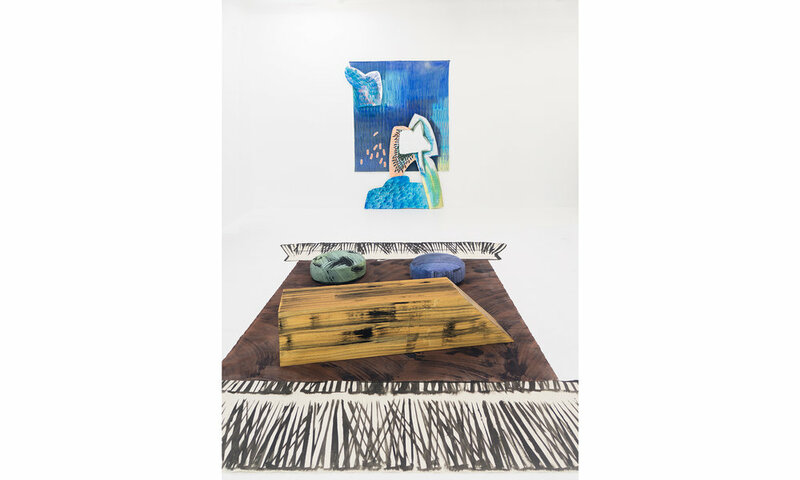 She has had solo exhibitions at Denny Gallery (New York); Kathryn Markel Fine Arts (New York); Blueshift Project (Miami); and Galerie Protege (New York); and has been in critically reviewed group shows such as Metamodern at Denny Gallery and Immediate Female at Judith Charles Gallery (New York). 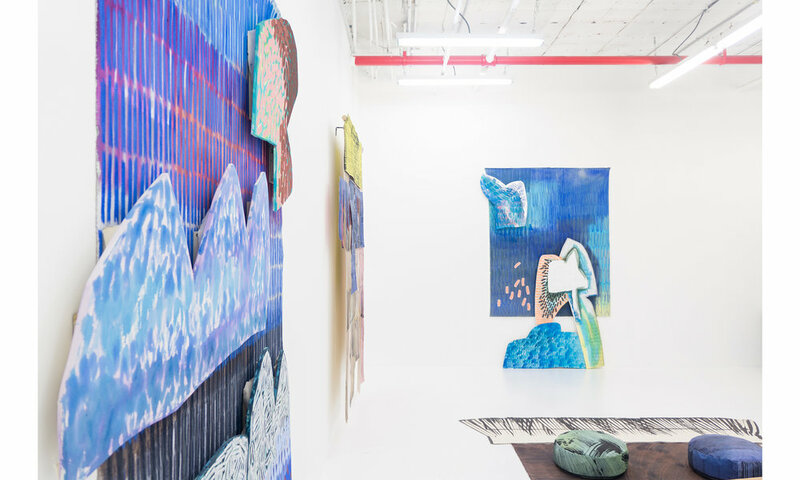 Her work has been reviewed or featured in Hyperallergic, New York Magazine, The Observer, The Huffington Post, Artsy, Artspace, Arte Fuse, Two Coats of Paint, and On Verge. Ali Silverstein lives and works in Los Angeles, California. She holds an undergraduate degree from Columbia University in Visual Art and Comparative Religion, and an MFA in Painting from The Slade School of Art in London. Silverstein’s work has been featured in multiple international solo exhibitions with Bischoff/Weiss Gallery in London, Inga Gallery in Tel Aviv, Albertz Benda Gallery in New York, and The Box Gallery at The Standard Hotel in Hollywood. She was recently named an “Artist to Watch” in the Women in the Arts issue of Whitewall magazine. Additionally, she has been included in The Joshua Treenial in Joshua Tree, California, “Wild Blue Yonder”, a semi-permanent installation at LAX airport, “Summer of Love” at Wilding Cran in LA, “Diverge/Convene” at The San Diego Art Institute.